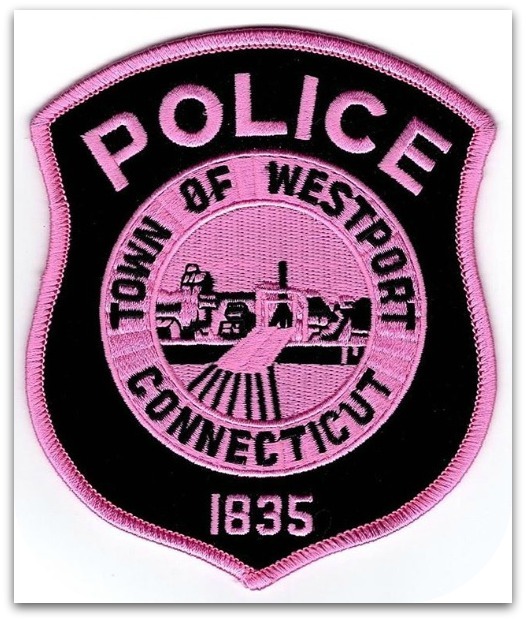 The Westport Police Department is a longtime supporter of breast cancer research. Every October, they find an innovative way to raise awareness of the deadly disease. A couple of years ago, for example, they tooled around town in a pink Maserati. This year they’ve turned their patch from familiar blue to powerful pink. Throughout October, officers will wear the patch. All month long too, they’re selling the pink patches to the public as a fundraiser. The cost is $10 each, at police headquarters (50 Jesup Road). All proceeds will be donated to Pink Aid of Westport. This entry was posted in Organizations, Police and tagged breast cancer awareness, Pink Aid, Westport Police Department. Bookmark the permalink. Chief Sam Luciano RIP would be proud. The PD did post this on their FB page as well, and They told me it’s in other local media. They’re doing great work! Super nice, friendly, and helpful dispatcher tried to get them but was unsuccessful this AM. Call before going in to pick one up. They don’t have any at dispatch currently and the officer who is handling sales is on duty during the work week. Super nice, friendly, and helpful dispatcher tried to get them but was unsuccessful this AM. Sorry for not being clearer. They are being offered throughout the month of October. Today is September 29! Wonderful fundraising idea. Thanks for sharing. I just made a post about my first time in OR during a mastectomy and seeing cancer for the first time. So great to be a part of the conversation and bring awareness.